Excellent location. Very helpful and friendly staff, they could not be more accommodating. The room was immaculately clean, bed very comfortable. My only issue would be the limited options for breakfast based on the price paid for it. A hot option would have been nice. Overall I would highly recommend this hotel and will be back in the future. We were really pleased to have stayed here. 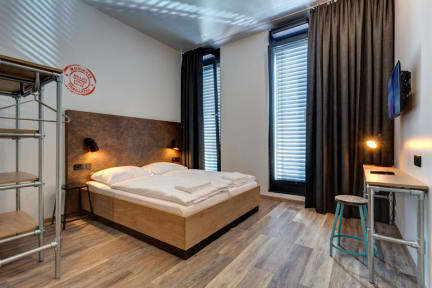 Really well placed to access Central Berlin in minutes and with friendly staff and great facilities. Very new, hotel-like facilities. Definitely the best hostel I’ve been to in terms of that. No atmosphere whatsoever though. Best suited to travellers who wants to take a break from socialising but want to stay in nice accomodation. The place was clean with friendly staff and a really great decor. The breakfast was plentiful. My only issue was with the process of checking out— I was staying in the dorm, and for some reason when someone else in my dorm checked out early, they checked me out too. Staff didn’t ask those people for ID and so when I went to check out, I was for some reason already checked out and it wasted a lot of my time trying to explain to them who I was. Staff needs to ask for ID when checking people out. Very clean hotel, a bit out of the main centre but a short walk to the underground train. We found more families staying here then 20's and we stayed over the ny period. Bed layout is awkward. Slept in mixed dorm and there is no space to change. Bathroom and shower stalls were super small. Also had two terrible snorers. Not the hostels fault but made my experience worse. This is not a hostel but rather a hotel with few dormitory rooms. I booked this last minute, failed to check properly but you would not get a hostel vibe from this place. Ended up in a mixed bedroom dorm with a dodgy old lady looking like a homeless person carrying her stuffs around. 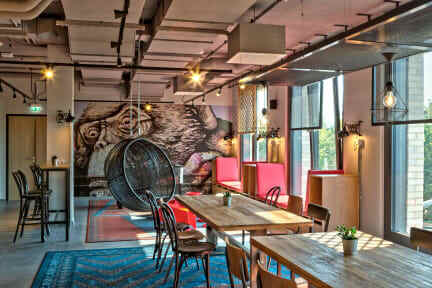 I booked a room for a night from hostelworld. I paid 19.41 euros prepaid. My room price was 109.97euros. When i arrive this hotel i paid 109.97 euros by credit card. I have receipt about it. 01.01.2019 i leave hotel. When i check my bank account i saw that this hotel charged me totally three times. On 31.12.2018 109.97 euros (it 's normal and i have receipt) and on 01.01.2019 there two charges: again 109.97 euros and 90.56 euros. I wrote them but there is no any reponse.